I’m not usually much of a baker, but something about the cold weather and the plethora of pumpkin recipes on Pinterest bring out that particular domestic skill. Usually I make some sort of egg dish for breakfast, but for a fancier weekend brunch, adding a slice of coffee cake to the mix is pretty delicious. 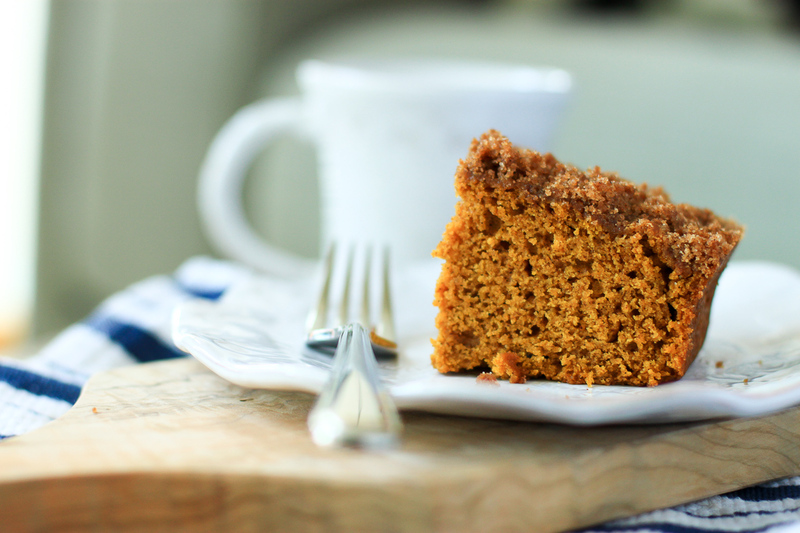 This one is full of tasty, warm spices and yummy pumpkin. The crumb topping adds extra sweetness and a nice crunch! I made this on Saturday afternoon and didn’t get around to eating it until Sunday morning, but it was just as good the next day. Especially when you heat it up for a few seconds in the microwave. One of my favorite little joys of fall is taking Oliver for a long, crisp stroll and coming home to a toasty breakfast and this recipe totally fulfilled that little love of mine! Preheat the oven to 350 degrees. Combine dry coffee cake ingredients in a large mixing bowl. In another bowl, whisk together all wet ingredients. Slowly fold the wet ingredients into the dry until just combined – you don’t want to over mix it. In a small bowl combine all crumb topping ingredients until well mixed. Spray a 9×9 pan with Pam and pour in the batter. Smooth the top with a spatula and then sprinkle the crumb topping over the top. Bake for 35-40 minutes (I actually used a smaller rectangular pan and ended up cooking for 45 minutes). Cake is done when a toothpick comes out of the middle clean!